Are you in the market for a new floor? A metallic epoxy floor is a unique piece of art that cannot be duplicated. Each pure metallic epoxy floor is different every single time it is done, making these floors highly sought after. The secret to metallic floors is the artist behind them because all installers have specific materials, they use to make these floors as beautiful as they are. Metallic floors are each very different, therefore, pricing does vary and can be hard to pinpoint. For more information give us a call today, speak to one of our professionals, and get all of the information you need! Due to their unique properties, metallic epoxy floors are highly sought after. Each floor is different making each person who owns one of these floors, different from anyone else. If you want quality results at low prices, give us a call right now! What makes metallic epoxy floors so desirable? Their individual qualities! Even if colors were copied from one project onto another, no two floors are the same, because the metallic movement cannot be identically copied. Metallic floors are made of mica pigments, which are added to clear epoxy, instead of pigmented epoxy. The designs are meant to create a different three-dimensional appearance with colors showing through. 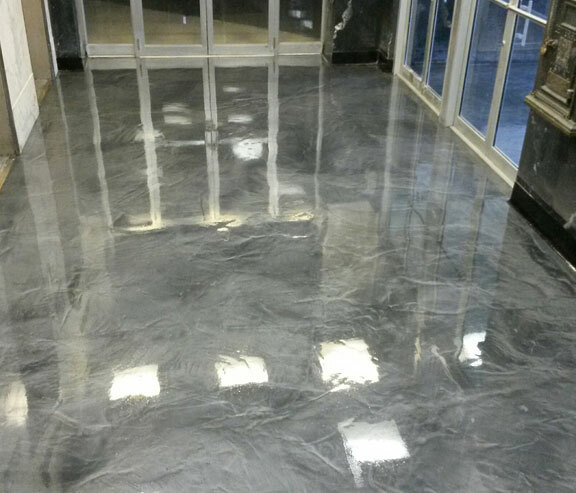 A metallic epoxy floor can be extremely translucent, making it highly unique, and extremely popular among property owners. Metallic floors are meant to show imperfections, contrary to other forms of epoxy flooring, because of the different ways the epoxy sets. Prior to applying a metallic system, your floors will be inspected, but any cracks or blemishes that may be missed will be enhanced with the colorful and clear epoxy. The high-gloss factor will turn the entire floor, regardless of blemishes, into art. Any slopes or blemishes in the original structure of the floor will affect the metallic epoxy product because until it completely sets, there will be changes. 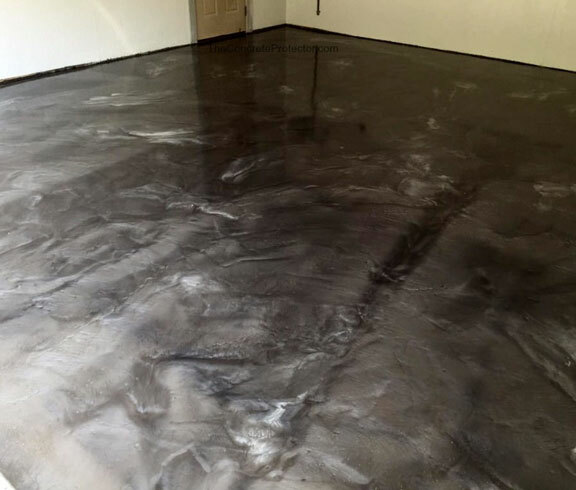 From the time that the metallic epoxy is applied until it is dry, it will change in ways that are out of your control and the contractors’ control. But that is the beauty of these floors! Are you in the market for a new flooring system? Metallic epoxy can take any boring floor and turn it into a unique piece of art. No two pieces can ever be the same, even if the colors resemble one another. If you’re not sure if you’re in the market for an epoxy flooring system, give us a call, and talk to one of our professionals. Epoxy flooring systems are becoming the hottest trend for more reasons than just one. If you want to extend the lifespan of your floor while also enhancing it, continue reading below. Epoxy flooring systems are extremely beneficial for any areas that have high foot traffic, are exposed to machinery, or handle spills and chemicals. Not only are epoxy floors resilient but they are extremely beautiful floors which brighten up any space they occupy. The shiny gloss surface helps brighten up any interior area. The durable service is able to withstand any heavy foot traffic and is quick and easy to install. Epoxy flooring systems are not only resistant to wear and tear, but they also repel oil, water, and chemical stains. The top coat seals off the pores of the concrete. Lastly, epoxy flooring systems add an element of safety because they offer a nonslip additive. With the ability to resist even the most uncommon threats, epoxy flooring far outlasts any price you pay for it. These floors are created to last for many years after installation and have the qualities to do so. A metallic epoxy floor is an extremely low maintenance system; although there are precautions you should take while you do have these floors. Being proactive against possible damages will ensure your floors lifespan. Taking preventive measures can help avoid costly repairs or replacements. If you’re not sure about a possible issue, we have trained professionals ready to help, give us a call with any questions you may have. For minor spills like oils, vehicle chemicals, or water, simply wipe those up. Routine cleaning, such as wiping up spills, is best done as soon as the spills occur. But for heavy cleanings, like soiled epoxy flooring, clear away any remaining debris and mop up with hot water and a cleaner that does not contain any acids. If you have questions about cleaning serious spills, give us a call. To avoid stains, especially ones that happen because of outside elements, bring in a mat for any entrance to have guests wipe their shoes. This will help prevent any outside contaminants. But if something were to happen, we suggest using a light scrubber and a non-acidic cleaner to remove harsh stains, if you have questions about this, please give one of our professionals a call. Daily or every other day sweeping can help prevent scratches or abrasions on your floors. 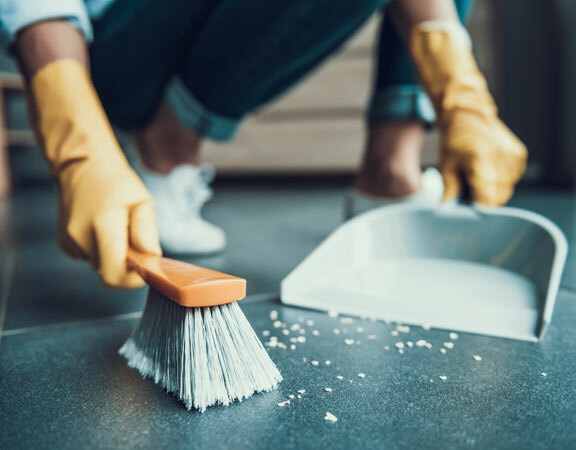 Do a periodical sweep to clear out any shards of glass, sharp pieces of rock, or anything else that could cause harm to your floor is left behind. Your floors are resilient to most things that would crumble other flooring systems. Metallic epoxy floors are low maintenance and do not require constant deep cleans. They are made to be beautiful but are able to handle anything you throw on them. If you have questions or concerns about your floors, please give our professionals a call.